It’s always oddly intriguing when a band detests one of their most revered works. Just as Paul McCartney loathed Let It Be’s wall of sound while Noel Gallagher scoffed at the silliness of “Roll With It” and Robert Plant practically disowned “Stairway To Heaven”, The Police have always regretted Zenyatta Mondatta. Having written the album on a non-stop tour (and under incredible pressure from their (then) struggling label to deliver another hit), they rush-recorded the successor to Reggatta de Blanc in just four weeks either side of festival appearances. The final version was handed in at 4am the morning before The Police embarked on another gargantuan world tour. It was a rush job that has bugged Sting and drummer Stewart Copeland (in particular) ever since. It’s true The Police usually recorded in four weeks periods, but spread over the course of a number of months, dipping in and out of the studio at their leisure. 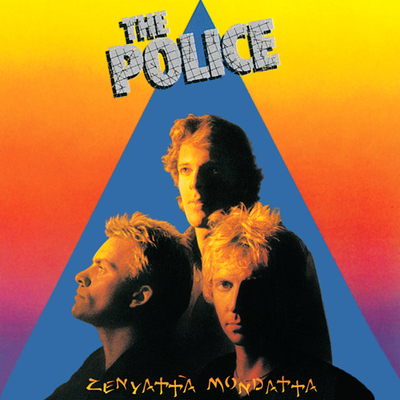 To its maker’s ear Zenyatta Mondatta felt half-baked, amateurish and un-finished in places, but listening in 2018 The Police’s third album sounds like an unmistakable hit (and the record buying public of 1980 clearly agreed). What’s striking about the album now, is not its timeless hits “Don’t Stand So Close To Me” and “De Do Do Do, De Da Da Da”, but the airy, paranoid grooves that linger and encircle almost every aspect of this chart topping collection. No one discusses The Police in these terms today – because they are regarded as larger than life hitmakers, icons of new-wave/80s yuppy-pop imperialism – but, in another universe, these Londoners could have been the next great jam band. Listening to the expansive sorrow of instrumental composition “Behind My Camel” or the frankly magnificent ennui of “When The World Is Running You Down…” you can almost imagine The Police attracting a Grateful Dead like cult following camping out to capture Sting’s brooding bass workouts live on tape. Of course Sting would come to embody a certain vision of neo-psychedelic spiritualism, but he was no dropout and never exuded that old hippie charm. Instead of weed and ‘shrooms, The Police’s existential jams channelled the skittish insecurities of jazz, which proved better suited to soundtracking the onrush of cocaine, caffeine and high frequency trading. Stewart Copeland might regret Zenyatta’s inherent lack of polish, but its loose, improvisational aura combines surprisingly well with Sting’s new found mistrust of politics at large. Sorrow and outrage defines the album, but not in any kind of overt or teenage way. Sting’s cries are repressed beneath busy, burbling, artful bass on “Voices Inside My Head” while, on “Bombs Away”, he proves almost sarcastically jubilant, cooing, “bombs away, but we’re okay” as Andy Summers unleashes a tubular, snaking solo. Quite remarkably, surrounded by so much well disguised and deftly conjured darkness, “De Do Do Do, De Da Da Da” hits with a brutal thud. Sting is so disgusted and disengaged from politics that he is no longer interested in winning the argument, he simply seeks to preserve his sanity by plugging his ears and spouting gibberish: “Their logic ties you up and rapes you/De Do Do Do, De Da Da Da, the innocence will pull me through”. Not only is that some seriously heavy stuff for a top 10 single, it’s hard to picture a more unusual angle from which to write what effectively amounts to a protest song. The Police are dropping out and disengaging by refusing to embrace a cruel and cynical world view – it’s the polar opposite of typical try-hard, overly on-the-nose, “political” pop of decades past – Sting merely seeks escape. It helps that the track is a immediately proceeded by the Grammy winning instrumental “Behind My Camel”, which has the haunting air of both a nuclear winter and a long walk home, late at night, through the wrong part of town. Of course Sting would disagree, he argued vehemently against the track’s inclusion, refusing to play on it and forcing Andy Summers to record the bass and lead guitar parts. Discussing the song years later, Sting’s disgust remained in tact, “I hated that song so much. One day when I was in the studio, I found the tape lying on a table. So I took it around the back of the studio and actually buried it in the garden”. Sting may well have a point. Zenyatta Mondatta is a skittish listen that proves hard to pin down with both mood and tone shifting almost at random. It’s classic, but anything but coherent. And yet, this baffling quality, along with the album’s despairing and distant air makes it one of the rock’s finest transition records. The Police were no-longer slick post-punks combining stiff white rock with soulful, blissed out reggae; suddenly they were disillusioned wanderers exploring their insecurities in grand unsettling sound. “Shadows In The Rain” best captures this evolution as Sting’s stonking funk groove meanders seductively while, simultaneously, Andy Summers turns his guitar inside out in search of ever gnarlier impressions. It’s brilliant, but it’s hard to imagine the two men were even in the same room at the time of recording – it’s that disparate. Nearly 40 years later Zenyatta Mondatta remains a mysterious and seductive listen. Its taut experimental tensions and loose, languorous grooves remain entirely distinct in the pop cannon. The Police were hurried and impelled to produce a money spinning record: their answer was to fractiously stew in their own juices, jamming for their own amusement while disdaining the state of the world. Implausibly, this sublimely stand-offish record went double platinum, but then again, we should not be so surprised: as darkly unnerving as the first 30 seconds of “Don’t Stand So Close To Me” may be, the song soon blossoms into one of the most devastatingly effective hit singles in rock history. The Police are nothing, if not wolves in sheep’s clothing. Tense and distrusting, The Police’s skittish third album sees Sting and co. give the world the cold shoulder with a selection of chilling, but still relentlessly groovy instrumental workouts. The band’s pop chops remain unassailable, but this is a darker and more disconsolate listen than its timeless hit singles would lead you to believe.